This is a privately owned 2500 working Citrus and Cattle Ranch and where you can pick citrus fresh from the tree during season (November-May). Also, there is an Old Time Country Store full of local goodies year round. Monster swamp buggies cruise through a 2,500-acre family farm inhabited by exotic wildlife like an alligator, turtle, Bald Eagle, wild turkeys, cattle, water buffaloes, zebra, and longhorns. They also have more than 50 varieties of citrus fruit trees. AND, its just 15 min. from Disney!! 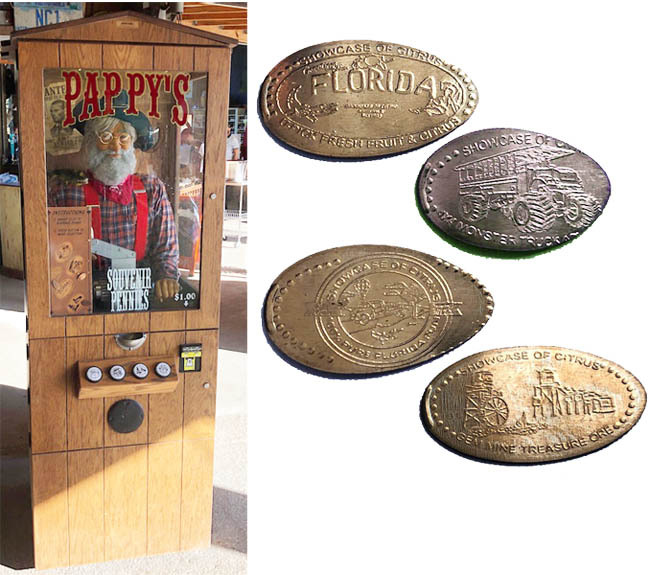 This location has a 4-design Electric "Pappy" penny press machine. Each design is $1, and the machine supplies the penny. All have Show Case of Citrus, on them. thegillion added Show Case of Citrus to system.